A hidden gem of a wine region with stunning scenery, down-to earth hospitality, diverse outdoor activities – and plenty to eat and drink, says Howard G Goldberg. Published in the June 2011 issue. Main soil types: Shale, sandstone, limestone. Fossils are common. The Iroquois Indians’ legend that God’s hand dug the north-south Finger Lakes is apocryphal but understandable. Visitors to this placid, cool-climate region of red barns, grazing cattle, majestic clouds and painterly sunsets discover God’s country. Even in American winedom, the gently rolling central New York State landscape surrounding the shimmering fresh-water lakes of Seneca, Keuka and Cayuga is still largely a public secret. 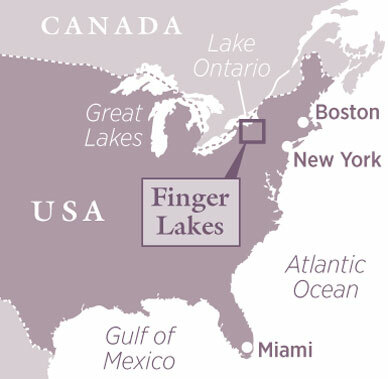 The federal government has designated the Finger Lakes, the state’s largest wine region, as an American Viticultural Area. Seneca and Cayuga are also smaller AVAs. Although Riesling, Chardonnay and Gewurztraminer stamp the region as primarily white-wine country, such reds as Cabernet Franc, Pinot Noir, Cabernet Sauvignon and Blaufrankisch (aka Lemberger) are gaining interest. Producers around the lakes have established wine trails, with separate literature and events. The hub is 62km-long Seneca, with 56 of the three lakes’ 109 producers. Cayuga is marginally longer. (With bottoms below sea level, both count among North America’s deepest lakes.) On 32km-long, Y-shaped Keuka, some steep banks resemble parts of the Mosel River in Germany. Although glaciers carved 11 lakes, these three significantly define the wine district. Receding ice left behind stratified sandstone and shale rock formations, dramatic gorges and abundant waterfalls that woo photographers and backpackers. Canandaigua, a fourth lake, has a minor wine route. But the highlight, on the shoreline in its namesake town, is the state wine industry’s educational headquarters, the New York Wine and Culinary Center. Its tasting room, restaurant and bar offer introductions to the state’s still and sparkling wines and artisanal beers, while an exhibition room provides interactive lessons about New York wine. Eager visitors emerge early from hotels, inns, motels, bed-and-breakfasts and rented lakeside cabins for a plethora of activities: to tour wineries, swim and golf, as well as go fishing, camping, horseback riding, canoeing, kayaking, water-skiing, biking, scenic driving, hiking, bird-watching, state-park visiting and antiques-shopping. Carracing in Watkins Glen is also a big drawcard. The long rural driving distances between and around the lakes – no bridges exist – and short runs between wineries can be best managed by careful planning. Cafés at rustic boutiques and larger-scale operations sell snacks for picnics on lawns and water-view decks. The lakes, fed partly by well-drained hillsides, absorb the summer heat, which buffers vineyards against early pre-harvest frosts; they also radiate winter cold, which retards spring growth, protecting buds from destructive early frosts. After summertime, the richest visiting period is autumn, when tree-bordered vineyards turn into gold, russet and purple patchwork quilts, and wood smoke spices the crisp, luminous air. In deep winter, among the few souls out are hardy ice fishermen seeking bass, trout, pike and landlocked salmon. There’s no pretentiousness among these down-to-earth folks in small-town America. Their grape, wheat, oats and barley country has been conservative and low-key since the late 19th century, when the lakes first became synonymous with New York State ‘Champagne’, and fancy restaurants in Manhattan (and in an incredulous Paris) ordered the famed Great Western brand by the bargeload. The region’s modern rebirth dates to the state legislature’s passage of the Farm Winery Act of 1976. This law made it inexpensive and easy for economically depressed farmers dependent on such native grapes as Concord, Niagara, Catawba and Diamond to establish wineries and sell the vividly flavourful output for far more than the fruit alone could bring. More importantly, they introduced classic European grapes to the region. Today, as gauged by its more than 300 wineries, New York is the country’s fourth-biggest wine state, after California, Washington and Oregon. Small-scale producers’ bottom lines mandate that both native and French-American hybrid grapes still figure into the mix. Such minor grapes as Seyval Blanc, Vidal Blanc and Vignoles (formerly called Ravat) yield charming, sometimes impressive wines that could belong in France’s low-priced vin de pays category. So do Cayuga White, Melody and Traminette, developed at Cornell University’s New York State Agricultural Experiment Station in Geneva, at Seneca’s northern end. All are worth seeking out in shops and restaurants. In this agricultural Eden, farmers’ markets and scattered farm stands are seasonal cornucopias. 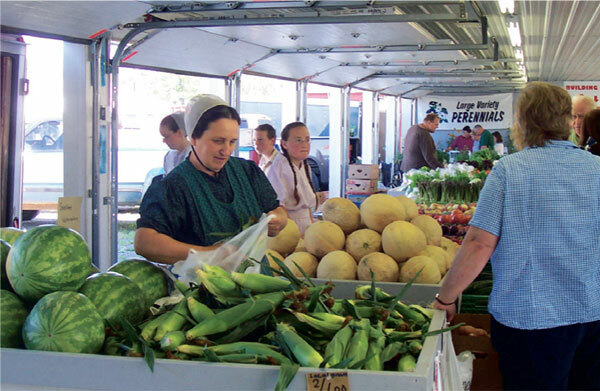 They display peaches, plums, cantaloupes, corn, pumpkins, squash, potatoes, cabbages, beans, carrots and garlic. Kids love helping in commercial ‘u-pick’ apple and cherry orchards and in tomato, blueberry, strawberry and raspberry patches. Here, no one goes hungry – or thirsty – for long. By plane: Flights from London to Greater Rochester International Airport take eight hours. By car: The drive from Rochester to the lakes can take 90 minutes to two hours, depending on whether Keuka, Seneca or Cayuga is the destination. Driving directly from New York City can take up to six hours.